Includes charts that cover Olympia, Washington, north on the east "inside passage" of Vancouver Island to Queen Charlotte Strait. Full color aerial photos enhance the historical charm of this book and its index of over 3,000 locations is extremely helpful. Read about the shoot-out on Skagit Island with one of the members of Butch Cassidy’s "Hole-in-the-Wall" gang or about how some "excellent fish" weighing up to 200 lbs. each inspired Capt. Vancouver to name the coastline adjacent to the Fraser River. 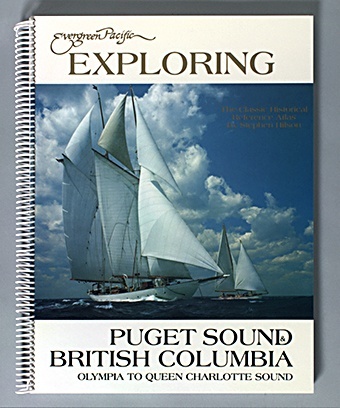 Before this classic historical atlas was republished in 1994, used copies of Stephen Hilson’s Evergreen Pacific Exploring Puget Sound & British Columbia sold for up to $150. This reissue of Hilson’s nautical atlas contains reproductions of government charts that are filled with historical anecdotes.